V.R.P. Super Shine Dressing is a dry-to-the-tough water-based dressing that works great on leather, vinyl, plastic, rubber and tires. V.R.P. can be used on both interior and exterior surfaces. It creates an invisible shield that repels water, dirt and dust. It also protects surfaces from damaging UV rays. V.R.P. Super Shine Dressing resists drying, fading and cracking surfaces to aid in maintaining interior and exterior surfaces while at the same time enhancing shine and image. V.R.P. Super Shine Dressing not only provides shine and protection, it is 100 percent dry-to-the-touch which means it is never greasy or oily. V.R.P. 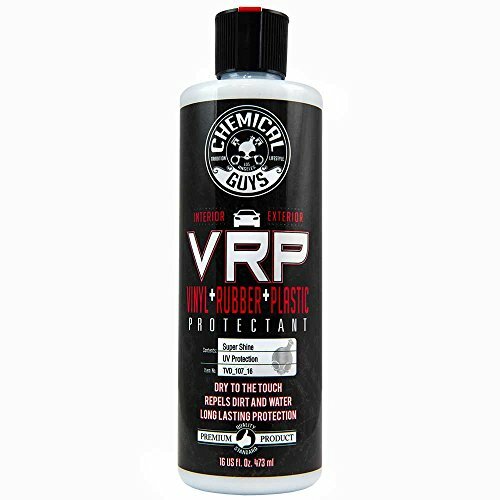 Super Shine Dressing brings out the true shine and texture of leather, vinyl, plastic, rubber and tires. It can be applied as often as you like without the fear of any clouding or discoloration. V.R.P. Super Shine Dressing features patented UV absorbers that penetrate deep into surfaces and act as a protective barrier against harmful UV rays that can cause premature aging, cracking, fading and peeling. The UV protection in V.R.P. Dressing protects surfaces from fading and dulling. View More In Paints & Primers. If you have any questions about this product by Chemical Guys, contact us by completing and submitting the form below. If you are looking for a specif part number, please include it with your message. Dupli-Color BCP103 Silver Brake Caliper Aerosol - 12 oz. SM Arnold (65-903) Leather, Carpet, Vinyl & Hard Plastic Refinisher, Dark Red - 11 oz. Plexus 91-20214-01 Spray Cleaner - 13 oz. Pig Spit PSO Black Original - 9 oz.